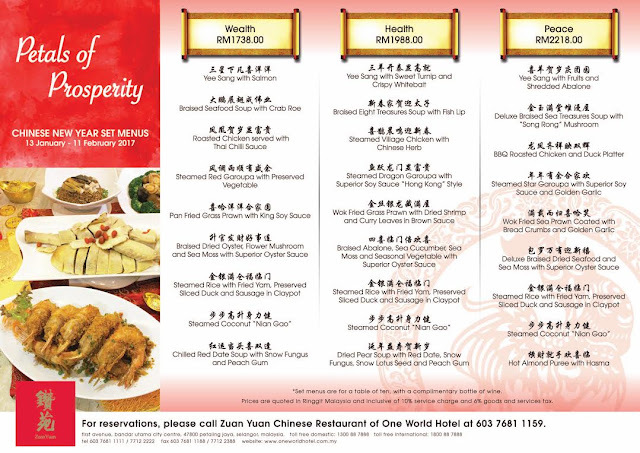 Usher in this Chinese New Year with extravagance at Zuan Yuan Chinese Restaurant, One World Hotel. It’s a season of indulgence with family and friends so gather at Zuan Yuan for a sumptuous Petals of Prosperity set menus specially crafted by Chef Ben Kong and the culinary team in honor of the Year of the Rooster. Choose from three set menus of Wealth, Health and Peace to celebrate the festive season with good food and great company as we welcome in the New Year with abundance of everything good. Renowned for their fine Chinese cuisine, Zuan Yuan serves a list of festive dishes symbolize with good health, fortune and peace to everyone this season. 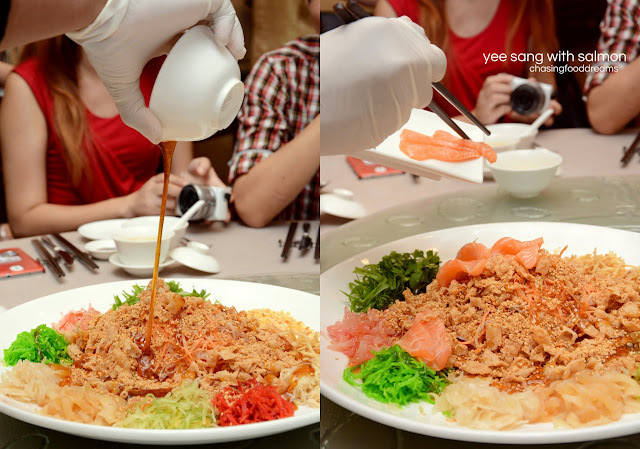 Leading the Chinese New Year celebration is the obligatory yee sang. One can never go wrong with the much beloved fish in Yee Sang with Salmon. Thick gorgeous slices of salmon with the medley of yee sang ingredients of jellyfish, pomelo sacs, radish, carrot, pickled vegetables, dried citrus peels, coriander, peanut, sesame seeds, Pok Chui and a tangy and sweet plum dressing is a sure crowd pleaser anytime. Here’s to tossing for Health, Wealth & Peace! The soup course is extra delectable with Deluxe Braised Sea Treasures Soup with Song Rong Mushrooms. The thick and luscious soup is filled with loads of dried seafood as well as crab meat and Song Rong mushroom. Finished with a lavish truffle oil, the soup is utterly dCNY Menuelicious to the very last drop. Many Chinese households tend to serve a whole steamed chicken during this festive. At Zuan Yuan, savor Steamed Village Chicken with Chinese Herbs prepared by Chef Kong with his recipe of special herbs infused into the chicken. 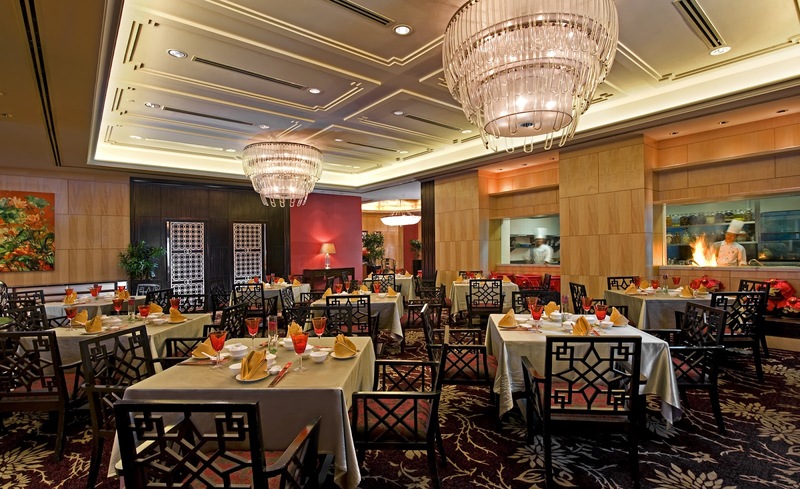 The fish course features a premium fish of Steamed Dragon Grouper with Superior Soy Sauce Hong Kong Style. Classic preparation in honor of showcasing the freshness of the fish, this one was steamed to perfection. The fish was so fresh and sweet while the superior soy sauce had just the right balance of flavours. It’s a season to ‘Har Har Siu’. 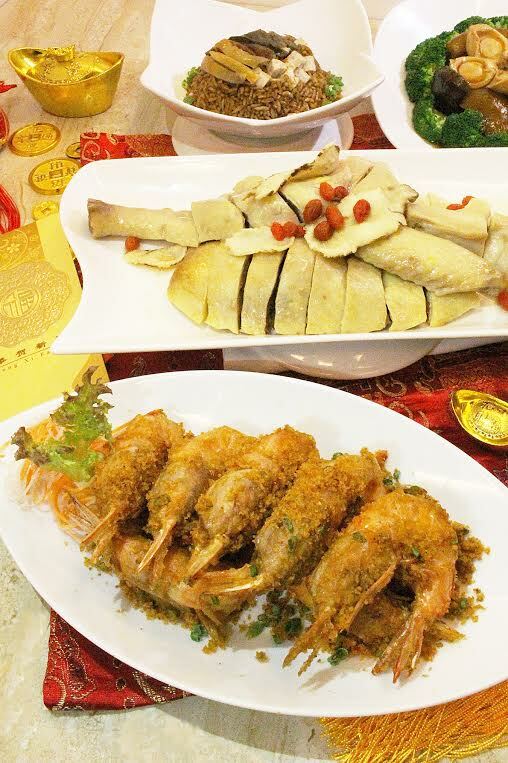 Wok Fried Sea Prawns Coated with Crumbs & Golden Garlic was beautifully presented in themed of Petals of Prosperity. The fresh crustacean was deliciously coated with moreish crumbs and cooked till crispy. One can even enjoy the shells because it was so tasty and crispy. The loads of garlicky crumbs enhanced the prawns’ sweetness to great heights. Dried seafood always makes an appearance during festive seasons. The Braised Dried Oyster, Flower Mushroom & Sea Moss with Superior Oyster Sauce may not be something new but it is always still a favorite among many, especially the elderly. Plump Hou See, earthy tender flower mushrooms, silky soft Fatt Choi, beancurd sheet and broccoli are all married together with a tasty dried seafood sauce. Another must-have during CNY is waxed meat with rice. Zuan Yuan’s version of Steamed Rice with Fried Yam, Preserved Duck Slice & Sausage in Claypot is one of the better ones around the city. Fluffy rice pearls coated with aromatic oils of preserved duck, Chinese sausage and liver sausage are made even better with cubes of creamy yam. It’s so good, one may want to go back for more helpings. Dessert symbolizes a sweet ending. This CNY, Chef Kong has prepared Steamed Coconut Nian Gao and Dried Pear Soup with Red Date, Snow Fungus, Snow Lotus Seed & Peach Gum. Sweet and sticky white Nian Gao covered with fresh coconut is nicely contrasted with a soothing sweet dried pear soup. The snow lotus and peach gum are said to beautify the skin and keep the body warm and neutral. All CNY set menus cater for a table of ten and comes with a complimentary bottle of wine. The set menus are available for lunch and dinner. For more information or reservation enquiries, please call 603 7681 1159 or email zuanyuan@oneworldhotel.com.my.